The University of Notre Dame’s iconic 15th president, Rev. Theodore M. Hesburgh, C.S.C., was honored and remembered Wednesday night (March 4) at a memorial service in Notre Dame’s Joyce Center. Father Hesburgh, one of the nation’s most influential figures in higher education, the Catholic Church and national and international affairs, died Thursday (Feb. 26) at Notre Dame. He was 97. 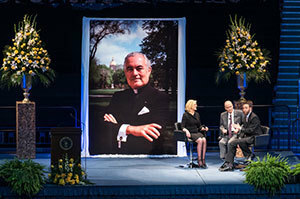 Reflecting before an audience of some 9,900 people on Father Hesburgh’s long and multifaceted career of service to Notre Dame, the Church, the nation and the world, speakers at the event included many of his friends, among them former president Jimmy Carter and first lady Rosalynn Carter; Condoleezza Rice, former secretary of state; former Wyoming Sen. Alan K. Simpson; Cardinal Theodore McCarrick, archbishop emeritus of Washington, D.C.; former Pennsylvania Sen. Harris Wofford; former Notre Dame football coach Lou Holtz; Indiana Sen. Joe Donnelly; and Indiana Gov. Mike Pence. Serving as the emcee of the event was Anne Thompson, NBC news correspondent and 1979 Notre Dame alumna and Trustee. President Barack Obama addressed the service in a prerecorded message, praising Father Hesburgh for his service on the Civil Rights Commission during some of its most difficult years. Obama recalled how Father Hesburgh invited commission members to meet informally at the Notre Dame property at Land O’Lakes, Wisconsin, to relax, fish and bond, thus facilitating a fruitful unanimity that greatly benefited civil rights in America. The evening included musical performances by the Notre Dame’s Symphony Orchestra and Concert Band, and several of its student choirs interspersed with memories and reflections from the speakers. President Carter, who spoke at the 1977 Notre Dame commencement ceremony, recalled Father Hesburgh’s work on immigration reform and other services and repeated and reaffirmed what he had said of his friend 38 years ago. “He was the most consistent and effective spokesman for the rights of human beings that I have ever known,” Carter said. With affectionate amusement, he remembered granting Father Hesburgh the favor of allowing him to fly as a passenger on a then top-secret U.S. military aircraft, the SR-71 Blackbird, at a record-breaking 2,200 miles per hour. “I’m proud that I was able to do that for him because he did so much for people everywhere,” Carter said. The memorial service concluded several campus events in memory of Father Hesburgh on Tuesday and Wednesday (March 3 and 4), including a visitation, wake and funeral Mass in the Basilica of the Sacred Heart, and a large procession to Holy Cross Community Cemetery. From Tuesday at noon until the funeral Wednesday, more than 12,000 Notre Dame students, alumni, faculty, staff, friends and admirers of Father Hesburgh filed past his body, which lay before the Basilica’s main altar. Father Hesburgh’s funeral Mass was celebrated in the Basilica Wednesday afternoon, with Rev. Thomas J. O’Hara, C.S.C., provincial superior of the United States Province of the Congregation of Holy Cross, presiding. Concelebrants of the Mass included Cardinal McCarrick; Cardinal Roger Mahony, archbishop emeritus of Los Angeles; Archbishop Blaise Cupich of Chicago; Archbishop Joseph Tobin of Indianapolis; Bishop Daniel Jenky, C.S.C., of Peoria, Illinois; and Bishop Kevin Rhoades of the Diocese of Fort Wayne-South Bend. Notre Dame president Rev. John I. Jenkins, C.S.C., preached at the Mass, recounting his “not only celebrated, but beloved” predecessor’s multifaceted career of service; his involvements in movements of civil and human rights and world peace; and his unreserved commitment to his vocation as a priest. “He was first, foremost and always a priest,” Father Jenkins said. Following the funeral, more than a thousand students flanked Notre Dame’s Holy Cross Drive for the procession to Father Hesburgh’s grave in Holy Cross Cemetery on the north bank of Saint Mary’s Lake. Originally published by Michael O. Garvey at news.nd.edu on March 04, 2015.